Pennsylvania Women Work’s “Reshaping Your Future” Career Conference is held every spring in downtown Pittsburgh. Conference attendees include men and women of all backgrounds who are looking to make a change in their career paths. The 14th Annual Career Conference took place at PNC Firstside in downtown Pittsburgh on Saturday, April 6, 2013. This year’s event boasted over 200 registered participants, 10 workshops, and 19 employment and vendor tables. Two keynote speeches were featured during breakfast and lunch. The morning address was given by Paula M. Bozdech-Veater, retired United States Navy Captain. The lunchtime keynote was presented by Candi Castleberry-Singleton, Chief Inclusion and Diversity Officer of UPMC Center for Inclusion. Featured workshops included “Do You Have What It Takes to Be an Entrepreneur?” presented by Rebecca Harris, Director of the Center for Women’s Entrepreneurship at Chatham University, and “Crafting Your Resume for Career Success” presented by Jill Patterson, National Account Manager of Monster.com and Vice President of PA Women Work's Board of Directors. 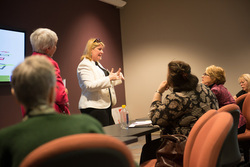 Additional workshops featured professionals from UPMC Health Plan, Fairmont Hotels & Resorts and others. Also, a panel discussion was presented by Bidwell Training Center, Carlow University, Community College of Allegheny County and Pittsburgh Technical Institute for participants interested in furthering their education. Mock interviews were conducted by local human resources professionals to allow participants to practice and receive immediate feedback and input. The Career Conference Committee was chaired by PNC’s Deborah Lee, with support from Christina DiGiulio, PNC, Adam Vranesevic, BNY Mellon, and the PA Women Work staff, especially Donna Fogle. Free chair massage services were generously provided by the massage therapy program at Community College of Allegheny County. Check back soon for information about the 2014 Career Conference.